Two narcotics detectives, Jimmy 'Popeye' Doyle (Gene Hackman) and Buddy Russo (Roy Scheider), follow a hunch that may lead them to a French heroine supplier and a huge drug bust. 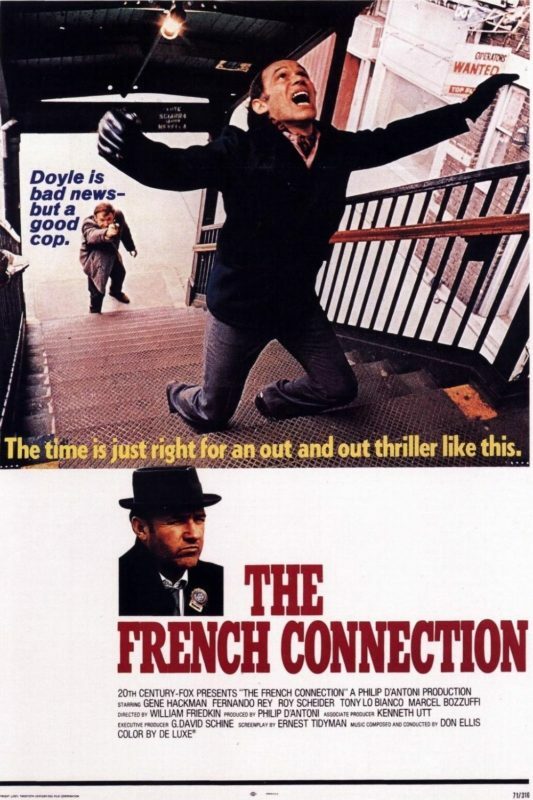 "The French Connection" is a gritty crime thriller from director William Friedkin. It was nominated for eight Academy Awards and took home five Oscars, including Best Picture, Best Director, Best Actor, and Best Adapted Screenplay. It stars Gene Hackman as Jimmy 'Popeye' Doyle, a rough around the edges narcotics detective who is quite good at his job even though his methods and actions are sometimes questionable. Hackman performs the part of the passionate and lets face it, kind of racist police officer quite well and as we mentioned, took home an Oscar for his efforts. Roy Scheider plays Buddy Russo, who is Doyle's partner and the Yin to his Yang. Russo seems a little less rough than Doyle and is often good for a quip. Like Hackman, Scheider is very good in his part, and though Scheider earned a nomination, he didn't take home a golden statuette. "The French Connection" has almost always been on our Netflix queue, but up until now, we had never taken the plunge to watch it. Now what we've seen it, we're impressed, though it is a bit dated in its racism and methodology. The movie has an interesting, frantic score that's noticeable right off the bat. The spastic piano plays erratically as low brass instruments come clamoring in to help add to the tension and mood of the film in an expert way. Though this is a Best Picture winner, it certainly isn't perfect, but really, no movie is. It does suffer from some pacing issues, even for being less than two hours in length. At times, some scenes don't seem to flow together smoothly, but maybe that adds to the erratic nature of the movie as a whole. Remember how we were talking above about dated methodology? Well, the blood in "The French Connection" certainly looks an awful lot like tomato soup and has an almost orange tint to it, making it a little unrealistic in a world now saturated with awesome blood squibs. A minor complaint overall, but it was something that annoyed us just enough to point it out. That being said, there are moments in this film that are as good as anything ever put on screen, particularly the scene where Doyle is attempting to chase down an armed assailant who just tried to kill him. This scene is taut, thrilling, and iconic even by today's standards. There is some really outstanding camerawork throughout this scene and it's exciting and tense to watch. "The French Connection" should really be on every cinephile's watch list as it's definitely a movie check out at some point for these scenes alone. One year ago, we were watching: "Sunset Blvd."